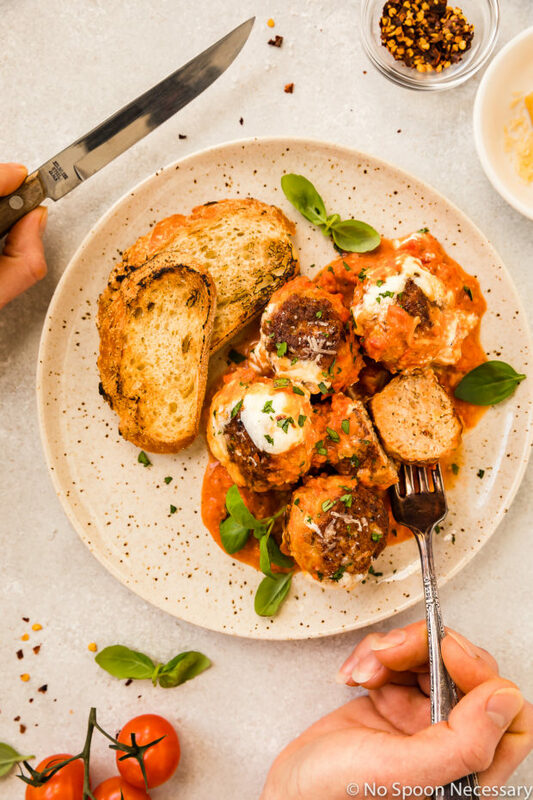 Golden brown, tender, juicy Baked Spicy Chicken Meatballs simmered in a creamy, luscious Vodka Sauce and smothered with oozy burrata and salty parmesan. Plus, tips on how to prepare chicken meatballs and tricks to keep them moist! This twist on classic Italian meatballs is easy to make and sure to become a family favorite! 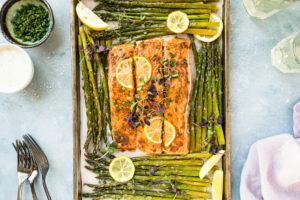 Today we are decidedly taking an itsy-bitsy break from “New Year, New You”, super healthy eats. 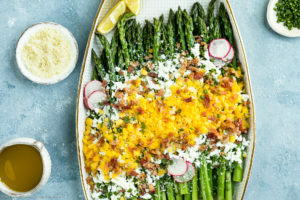 Because we are now smack dab in the middle of winter, and after 2 snow storm I’m craving something cozy and comforting. And, I’m hoping I’m not alone in my need for comfy clothes, fuzzy slippers and a soul-warming meal. 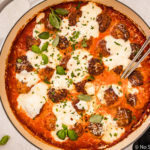 Plump, juicy and tender spicy chicken meatballs simmered and swimming in a creamy, luscious, vodka spiked tomato sauce; topped with decadent, rich burrata, salty parmesan, sweet basil and fresh parsley. Basically, these bad boys are quite literally AMAZE-Balls. 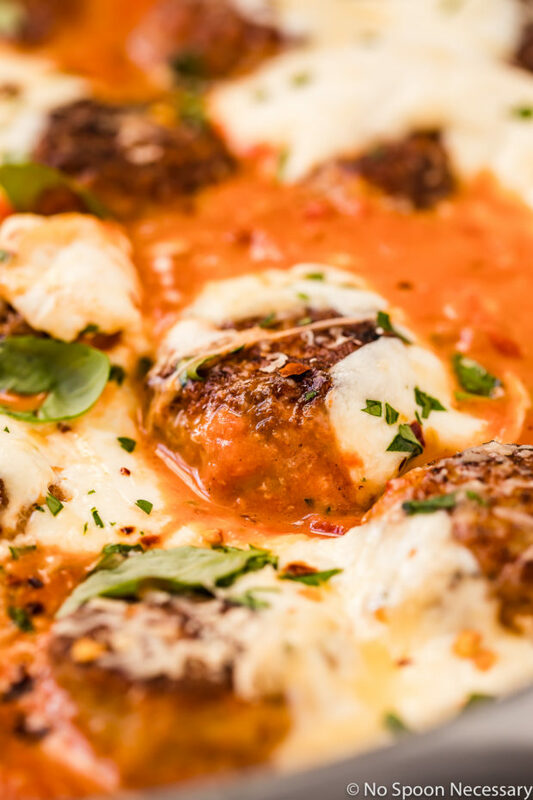 But then again, what’s not to love about golden brown meatballs, vodka sauce and ooey-gooey cheese?? 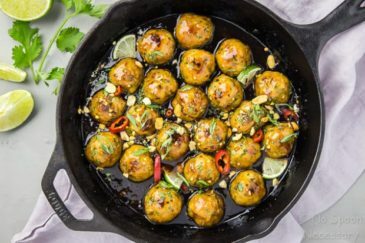 How to make chicken meatballs moist? There are a few tricks to keeping your meatballs moist, and not dry! The first is to make sure you are using a ground chicken mixture that is a combination of both white and dark meat. Most grocery stores carry plain ground (white and dark meat) chicken in the poultry case. 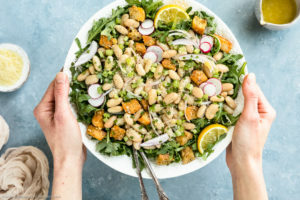 Just make sure you avoid anything marked as “all white meat” ground chicken, or “lean” ground chicken. 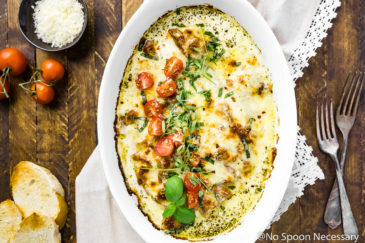 If you can’t find ground chicken that is a mixture of both white and dark meat, you can ask your butcher to grind chicken thighs and a chicken breast for you. Voila, a mixture of both! The second trick to moist chicken meatballs, is using both breadcrumbs and beaten eggs in your mixture. 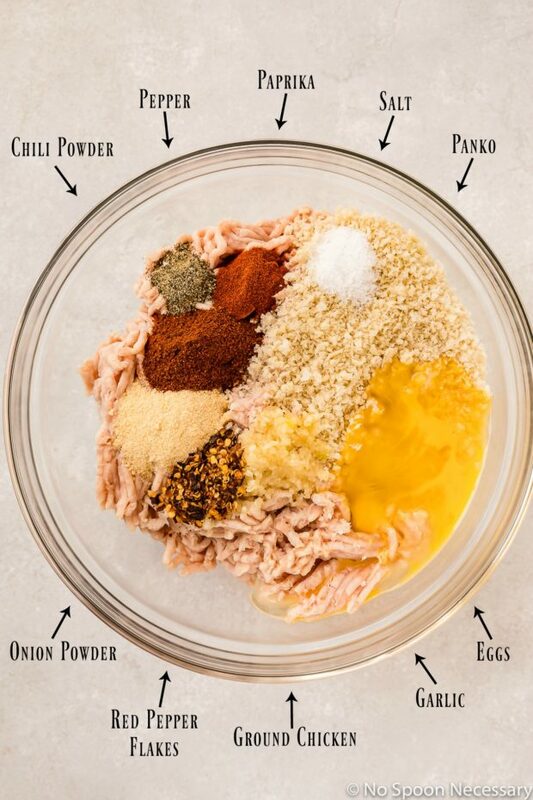 If you want to go one step further, you can mix the seasonings INTO the eggs and then add that to the ground chicken and panko. Mixing the seasonings into the eggs first will prevent overmixing the meatballs, which leads to a tenderer meatball. The last trick is pan-searing and then simmering the meatballs in the sauce. Pan searing the meatballs will give them a beautiful golden brown exterior, while gently simmering them in the sauce will produce a deliciously juicy meatball! 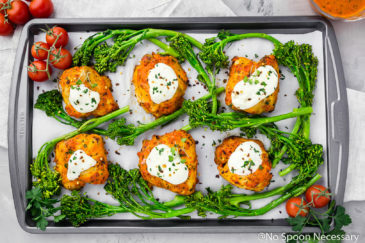 How to prepare chicken meatballs? These Baked Spicy Chicken Meatballs are ridiculously easy to prepare. 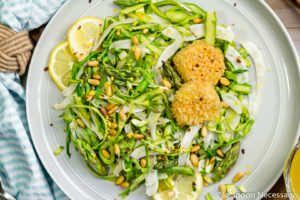 You simply place all the ingredients in a large bowl and mix everything together well. Scoop a heaping 2 tablespoons of the mixture into your hands and form them into a golf-ball sized ball. I use a small ice cream scoop to keep all the meatballs a uniform size. To prevent the mixture from sticking to your hands when rolling, spray your hands lightly with oil. If you want to test the meatballs mixture for seasoning, take a teaspoon of the mixture (before forming any of the meatballs) and roll it into a ball. Fry the small meatball in a hot pan until cooked through, turning the meatball occasionally. Taste the meatball and adjust the mixture for seasoning as desired. The Baked Spicy Chicken Meatballs can be prepared (and unbaked) up to 3 days in advance. 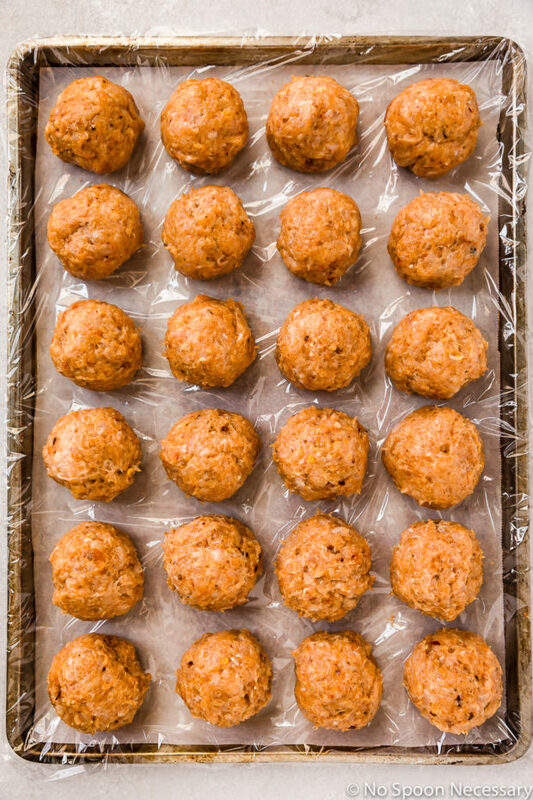 Store the meatballs on a clingfilm-lined tray, cover with more plastic wrap and transfer them to the refrigerator. The prepared meatballs will keep in the fridge for up to 3 days. In case you aren’t familiar with burrata, it is a fresh, semi-soft Italian cheese made from mozzarella and cream. The cheese is formed as a pouch and the outer shell is made of solid mozzarella, while the inside is filled with stracciatella and cream. Essentially, it’s cheese ball HEAVEN. Burrata can be located at most major grocery stores in the specialty cheese section. So, if you haven’t tried it before, you need to get your hands on some IMMEDIATELY. What does vodka sauce taste like? Contrary to it’s name, vodka sauce doesn’t have an overpowering taste of vodka. Vodka sauce tastes like a creamy, smooth, and slightly peppery tomato sauce. The vodka in the sauce adds a depth of flavor and serves to bring out the flavor of the tomatoes. 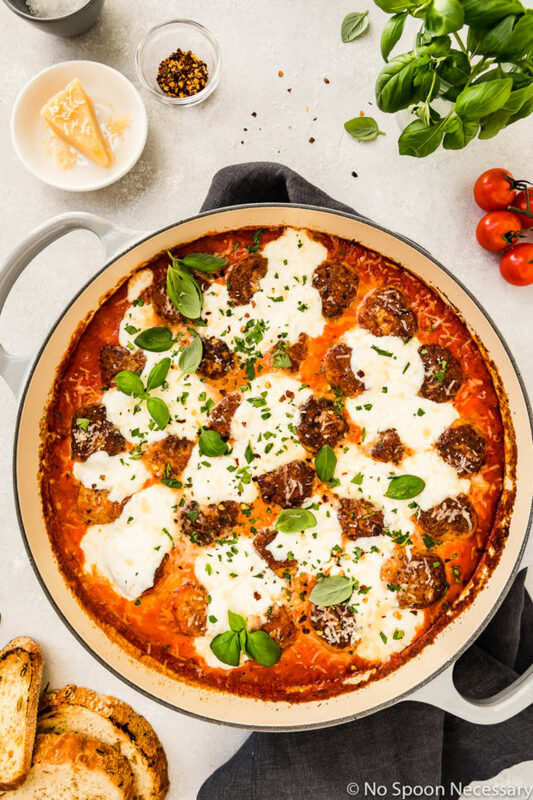 These Baked Spicy Chicken Meatballs in Vodka Sauce with Burrata as easy to make, downright delicious and sure to quickly become a family favorite! Until next week, friends, cheers – to cozy eats! 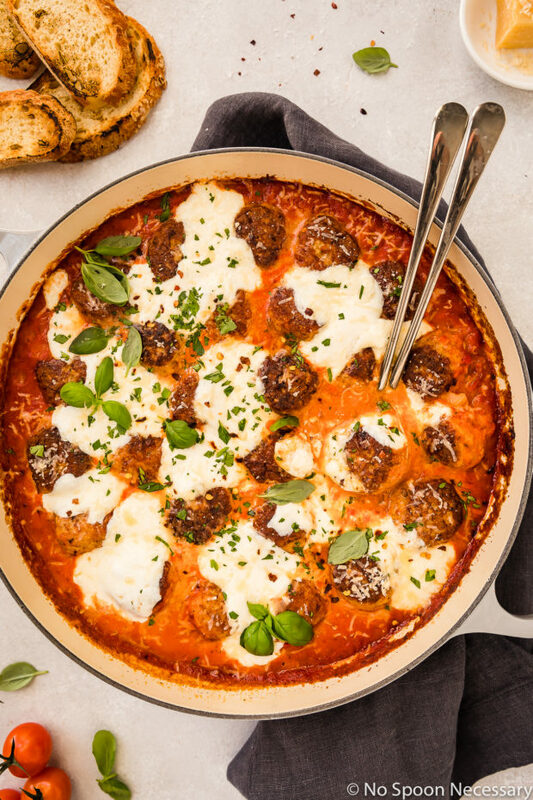 Golden brown, tender, juicy BAKED Spicy Chicken Meatballs simmered in a creamy, luscious Vodka Sauce and smothered with oozy burrata and salty parmesan. Plus tips on how to prepare chicken meatballs and tricks to keep them moist! 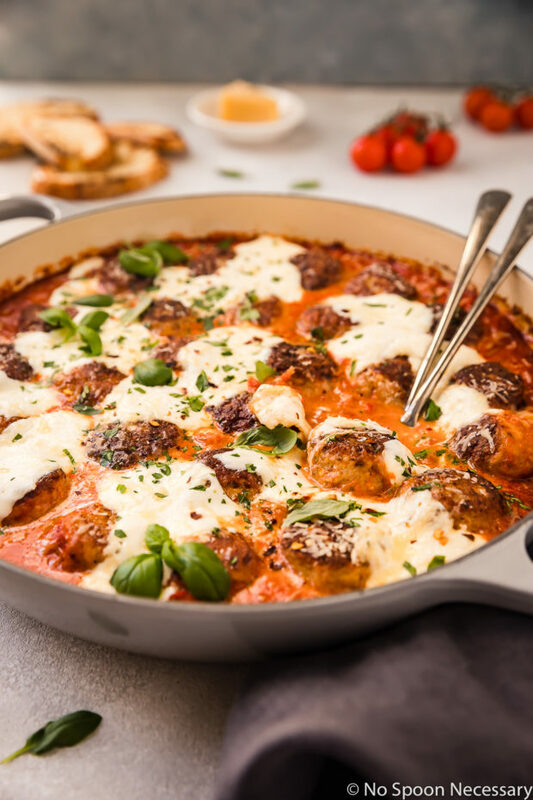 This twist on classic Italian meatballs is easy to make and sure to become a family favorite! Prepare the meatballs: Place the chicken, panko, 2 cloves of garlic, onion powder, chili powder, paprika, 1 teaspoon crushed pepper flakes and eggs in a large bowl along with 1 teaspoon salt and ½ teaspoon ground pepper. Mix well. Form into golf-ball sized meatballs (about 2 tablespoons each)and transfer to a plastic wrap-lined tray*. Brown the Meatballs: Heat oil in a large, oven-proof pan over medium heat until shimmering. Add meatballs to the pan (in batches if necessary to not overcrowd the pan) and cook, turning occasionally, until golden brown on all sides, about 6-8 minutes. 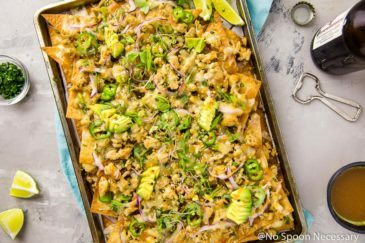 Remove and set aside on clean plate. Make the sauce: In the same pan you used to cook the meatballs (don’t drain the pan), melt the butter over medium heat. Add in the shallots and cook until lightly browned, about 3-4 minutes. Add in the tomato paste, remaining 2 cloves of garlic, and ½ teaspoon crushed pepper flakes. Cook until fragrant, about 1 minute. Remove from heat and add in the tomatoes, vodka and a generous pinch of salt. Return to heat and simmer, stirring often, until the alcohol cooks off, about 7 minutes. Stir in the heavy cream and cook until the sauce thickens slightly, about 2 minutes. Taste and adjust for seasoning with salt. Add the meatballs back into the sauce and transfer to the oven. Bake for 15 minutes. Remove from the oven and break the burrata on top, evenly distributing it across the pan. 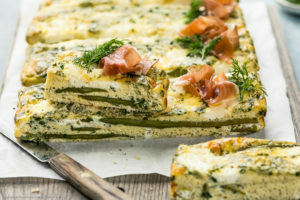 Return to the oven and bake for 8-10 minutes, or until cheese is melted. Remove from the oven and garnish as desired. Enjoy! To test meatball mixture for seasoning, fry a teaspoon of the meatball mixture in a hot pan. Taste and adjust mixture for seasonings. Tip for forming meatballs – spray your hands lightly with oil to prevent the meatball mixture from sticking to your hands. The chicken meatballs can be prepared (and unbaked) up to 3 days in advance. Store the meatballs on a clingfilm-lined tray, cover with more plastic wrap and transfer them to the refrigerator. The prepared meatballs will keep in the fridge for up to 3 days. 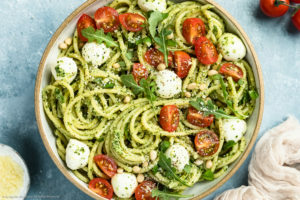 If you aren’t crazy about burrata, or can’t find it, you can substitute whole milk ricotta, fresh mozzarella, or a mixture of both!